I follow a lot of authors on social media. One thing I was struck by when I was first starting out, again and again, was that I had NO CLUE what it meant when they posted about revisions. I mean, I know what it means to revise—to write another draft, to re-work and better your writing—but I didn’t know what that actually looked like. Since then, through lots of trial and error, I’ve figured a revision process that REALLY works for me. My guess is that everyone’s revision process is different. But I thought it would be helpful to share what I do, specifically. Step 1: Draft your manuscript to the point where it’s as good as you’re going to get it. This process should be done on your own. Obviously you can bounce ideas off friends and critique partners, but you should work that story until you don’t know how or what to change to make it better. Now it’s time to pass it on to someone else. Step 2: Getting an edit letter. The meat of my revision process begins with the edit letter. For those of you who don’t know, an edit letter is essentially what it sounds like: a multipage letter, whether it be from a critique partner, a freelance editor you hire, your agent, or your editor, that details what needs to change in your story. Everyone writes them differently. Some folks break up their edit letters by story acts, others by categories like dialogue, character, plot, etc. The first edit letter I got for THE LONELY HEART OF MAYBELLE LANE was from a freelance editor (I worked with Mary Kole, and you can read about my experience here). Working with her was a great experience for me. I understand that not everyone can afford this, but you can find awesome critique partners online, trade full manuscripts, and write edit letters for each other. And just a note: for every single edit letter I get on a given manuscript—whether it’s from my freelance editor, my agent, or my editor at Knopf—this is the process that I use. Step 2: Reading and digesting your edit letter. As soon as I get my edit letter, I print it out. I gather pens and highlighters and I sit down with it. And then I read it. And re-read it. And read it again. I make notes in the margins. I highlight passages. Sometimes, editorial suggestions hit like a strike of lightning—it feels like, yes, this is what needs to happen that will make everything fall into place! Other times, you feel extreme resistance to ideas. You think, this person doesn’t understand what I was trying to do at all. All of that is okay and natural. My suggestion is to let it all sit. Let the advice sink in for as long as you can. For one edit letter, I hardly needed any time at all. The suggestions all felt like lightning bolts, and I dove into revisions the next day. But I recently got an edit letter that didn’t feel good. I wasn’t sure if some of the advice was right for the story, or if I was resistant to the suggestions because it would take a lot of work and thoughtfulness to make it happen. I had to let that edit letter sit for about three months before I was ready to look at it again, to parse out what felt “wrong” because it was actually wrong, and what felt wrong because I was resistant to doing the work. I realize that deadlines make this part hard, but take as much time as you possibly can. When you’re first faced with all the suggestions an edit letter might have for you to improve your manuscript, it can feel incredibly daunting. It feels amorphous and impossible. What follows next is how I deal with that and make revision suggestions from an edit letter feel bite-sized and achievable. Step 3: Pull suggestions from your edit letter and turn it into a clear outline. After I’ve let the notes and suggestions sit and stew, I start the next step: I pull every suggestion that resonates with me from the edit letter into a new document, turning it into general revision “to do” list. For example, let’s say the edit letter talks about a character relationship. Maybe your reader suggests that their friendship feels flat, dull, or uninspired. That it feels like they became insta-friends, which isn’t believable. Whatever. I take that suggestion and put it on my new revision outline. Sometimes I copy and paste the wording as is, other times I might condense it to say “friendship between character A and character B needs work.” Then I strike through that part of the edit letter to show myself I’ve taken care of it. I do this, again and again, until I’ve taken ALL of the suggestions from the edit letter and turned them into an outline. All of a sudden, it goes from overwhelming and scary to completely achievable. Step 4: Create a chapter-by-chapter revision plan. Now that I have my revision guide, I open a new document and create a chapter-by-chapter outline. Some suggestions might be chapter specific (expand, delete, move, deepen this moment or beat, etc), whereas others might be things you need to thread through the entire manuscript. By creating a chapter-by-chapter guide, you make sure you never get lost in the weeds. For the sake of simplicity, let’s say there are three main suggestions from your edit letter (though usually there are about 10x that): issues with your dialogue, the friendship plot between character A and B, and your too-slow plotting. Usually these are things you need to address in every single chapter. Obviously, this is very simplified. Usually the notes under each chapter are extensive for me. But I work through my general outline until ALL suggestions have been reflected in every chapter they need to address. 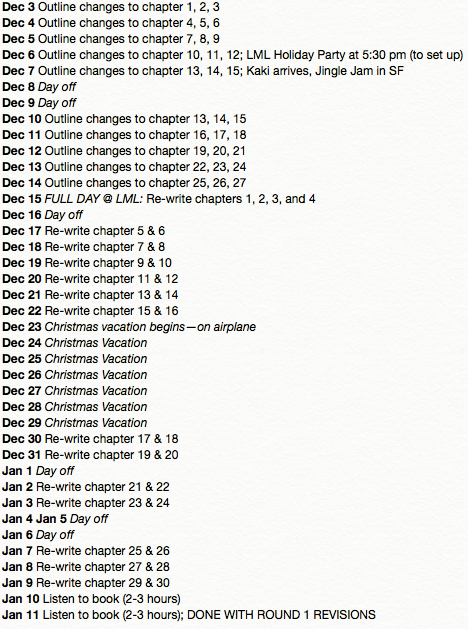 Now I have my chapter-by-chapter revision plan. 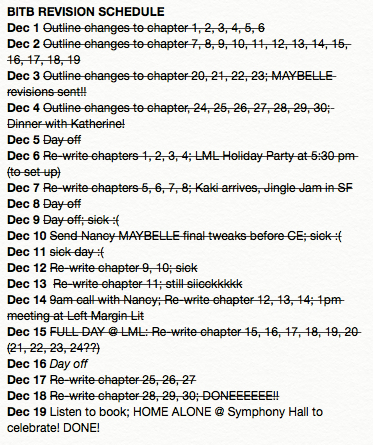 The revisions I need to make may not be easy, but now I have a plan of action with achievable steps. Step 5: Create a revision schedule for yourself. This is what keeps me on target, and is especially helpful if you’re on deadline. I usually give myself generous timing—usually more time than I think it’s going to take. I update my revision schedule as I revise every chapter. I’ve found it’s much better to be more generous with yourself rather than less—because when you revise quicker than scheduled, it feels so good! Step 5: Listen to the whole new draft out loud. After you’ve revised your book (I always start with a fresh document for each draft), listen to the new draft. I can’t read out loud to myself…my tongue would get too dry and fall off. I use an incredible program on my phone called Voice Dream. It will read the entire book to you. The voice is a little robotic, but it works. I cannot tell you how many typos, redundancies, and issues I’ve caught thanks to this process. It creates a much cleaner document. Step 6: Let it sit for a few days and then…SEND IT OFF! And drink a glass of champagne. Or a bottle. Revisions are tough, no matter how you approach them. Whatever the case, I wish you luck with revisions of your own and I hope this post was somewhat helpful! Hello friends! Consider this a slightly different version of a “How I Got My Agent” post. I thought it would be fun to share some of the details of my querying process, including my timeline, some stats, and the (ultimately successful!) query letter I used for THE LONELY HEART OF MAYBELLE LANE. I wrote the first draft of MAYBELLE in two months, finishing in April 2017. This felt incredibly fast for me (I’d toiled on my previous middle grade novel for more than a year, and had gotten to a point where adding to its word count felt more like getting teeth extracted than creative writing). Drafting MAYBELLE was an amazing, emotional, and deeply cathartic experience. I put everything I had into it. I ate lots of stale protein bars for lunch so I didn’t have to stop writing. I wrote until my legs fell asleep. I put my forehead on the table and wept the day I finished writing it. I then decided to make the investment of working with a freelance editor* on the manuscript, and based on her notes, did a big revision in the spring of 2017. But then I sat on the book for a good nine months because despite how much I loved it, I wasn’t sure it was quite right as a debut. That because I’m also interested in writing more commercial (or so I told myself) middle grade fantasy, maybe I should try to write and query a “bigger” project first. And so I tried to write something that I thought might be “more marketable.” And I tried. And tried. And tried. And…failed. I failed hard. Everything I wrote felt stale. Empty. Uninteresting. After half a year of these painful false starts, of deserted manuscripts with overcomplicated plots and flat characters, I did some soul searching. And that’s when I realized that starting a creative project thinking mostly about its marketability was a terrible way to make something I was proud of. So in November/December 2017, I returned to MAYBELLE, gave the manuscript a mental hug and apology, and started thinking seriously about querying. I ended up being grateful I set it aside for so long, because I did another revision where I caught things I wouldn’t have otherwise. I did a ton of research on agents I wanted to submit to. I went to bookstores and searched for agents in the acknowledgements of books I loved and books I thought were similar to mine. I searched through years of the MSWL hashtag on Twitter and looked at specific profiles on the Manuscript Wishlist website. I spent a ton of time on QueryTracker. I read blog Q&As and thought about the kind of relationship I hoped to have with an agent. I subscribed to a month of Publisher’s Marketplace so I could see the kinds of deals different agents were brokering. Once I had my list, I started working on the query itself. I read through all of the archived posts on Query Shark. I read all the queries posted on Writer’s Digest Successful Queries. I wrote a million drafts. For $25, I worked with a published writer/freelance editor to help me hone it. (Hi Laura, you’re amazing!) I posted the query on AgentQuery Connect to get feedback from other writers. I took this part really seriously. I knew I had only one shot and I didn’t want to mess it up! Eleven-year-old Maybelle Lane collects sounds. She records the Louisiana crickets chirping, Momma strumming her guitar, their broken trailer door swinging half-shut. However, the crown jewel of her collection is a sound she didn’t collect herself: an old recording of her daddy’s warm, sunshine laugh. It’s the only thing she has of his, the only thing she knows about him. Until one day, she hears that laugh—his laugh—pouring out of the car radio. Going against Momma’s wishes, Maybelle starts listening to her radio DJ daddy’s new show religiously. He’s everything Maybelle dreamed of: smart and funny and as warm as his laugh. When he announces he’ll be the judge of a singing contest in Nashville, she realizes this is her chance to meet him, and she signs up as a contestant behind Momma’s back. The problem: Maybelle’s terrified. She collects sounds, she doesn’t make them. It’s not that her voice is bad—Momma always says it’s the loveliest she’s ever heard—it’s that her bone-shaking stage fright keeps her from using it. But when her eccentric neighbor, Mrs. Boggs, offers to drive her to Nashville in her beat-up RV, Maybelle jumps at the opportunity. She’ll figure out the singing part later. Along the way, Maybelle convinces herself that her daddy will be the one to help her overcome her fears and find her voice—until an alarming discovery makes her question if he’s really the warm, wonderful man she’s built up in her mind. THE LONELY HEART OF MAYBELLE LANE is a 52,000-word contemporary middle grade novel that will appeal to readers who enjoyed the bittersweet tenderness of Kate DiCamillo’s RAYMIE NIGHTINGALE and the road trip fun of Ingrid Law’s SAVVY. What a wild ride. I know I am extremely lucky for a number of different reasons, including the speediness of my journey, but the best advice I would give is to take your time. Sit on your manuscript after you finish it—time will give you much-needed perspective. Find critique partners. Do an almost embarrassing amount of research. Do as many revisions on your query—and your manuscript—as possible. If you made it all the way down, bless you. I hope this was in somehow either interesting or helpful! *I am extremely lucky that I could make this (not small!) financial investment. I realize not all writers can do this, which is why I think it’s very important to be as transparent as possible. I was definitely able to get MAYBELLE to a certain point, polished-wise, because I was lucky enough to be able to afford it, which I definitely think gave me a leg up. I think authors should talk as openly about how we get our work ready for publication, especially if it entails financial burden that would keep others from that same success. For writers who can’t afford to spend money on freelance editing, I highly recommend entering feedback contests online or finding critique partners, who can be worth their weight in gold. Twitter is a great place to find these resources and connections. **I should also add: 10 of my 22 queries went out with a referral. However, the two offers I ended up getting were not from referrals—they were slush pile. So sure, I think a referral can get your foot in the door, but if your manuscript isn’t a fit for an agent, not even the most glowing or complimentary recommendation will get you a “yes”!